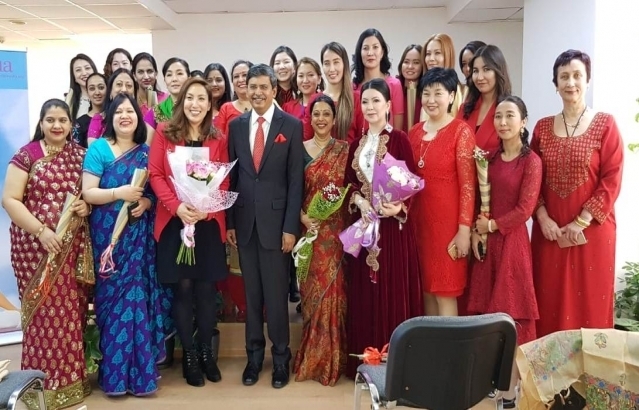 The Embassy of India in Kazakhstan celebrated International Women's Day on 8 March 2019 at its premises. Mrs Tamara Asar, a popular and famous Kazakh singer, holder of the Order of Honor, and Mrs Aliya Zholboldina, Chairman of the Committee "ExpoWomen", organizer of the International Women's Forum "Zhaina", attended the reception as the special invitees. The celebration commenced with the lighting of the lamp by Ambassador Prabhat Kumar, Mrs Tillotama Kumar and special invitees. Mrs Tillotama Kumar, the spouse of Ambassador, welcomed and addressed the guests with an inspiring speech on the occasion. Mrs Shruti Ghosh, a dance teacher at SVCC, Nur-Sultan, presented a dance performance called «Still I rise». Mrs Tamara Asar and Mrs Aliya Zholboldina were honoured by Ambassador Prabhat Kumar and Mrs Tillotama Kumar by awarding them certificates of appreciation and gifts in recognition of their contribution and achievements. The ceremony was followed by a speech of special invitees and delicious lunch of Indian cuisine.